A delicate and healthy take on the famous panna cotta recipe, that will both impress with its beautiful presentation and delight for its novelty of flavor. Combine the nut milk and agar powder in a saucepan. Scrape the vanilla bean along its length with a knife and add that bean “paste”, along with the bean itself to the pot (when using vanilla essence stir it in at the very end). Allow to sit with no heat for 15 minutes. Add the sugar, coconut milk and whisk together. Heat the mixture on a medium-low heat and slowly bring to boil, then lower the heat and simmer for 3 minutes stirring constantly with a wooden spoon. Turn off the heat and add the vanilla essence. Allow to sit for 10 minutes and then take out the vanilla bean pod. Pour equal amounts into small jars and place it in the fridge. 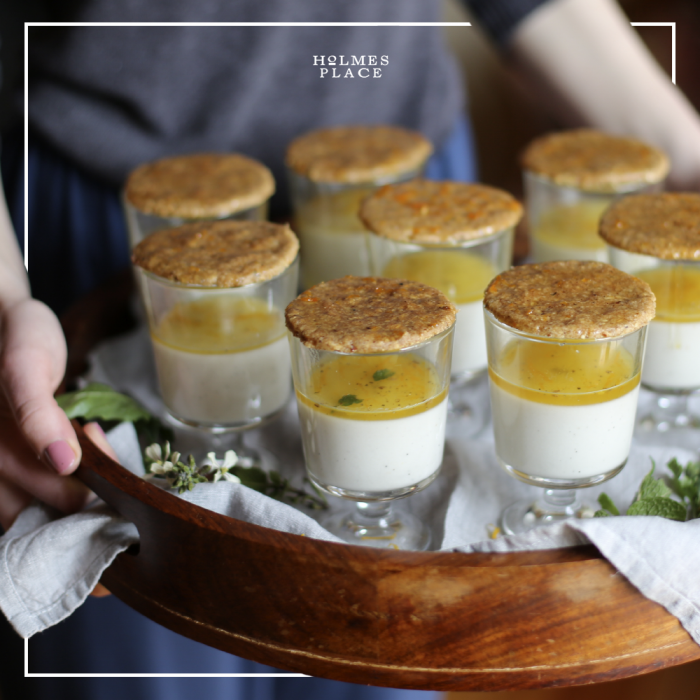 To serve, garnish with fresh mint, orange zest and drizzle with a serving of honey & orange infused syrup and serve with a honey hazelnut cookie. Preheat the oven to 180 C/350 F. Spread the hazelnuts evenly on a baking tray and toast them in the oven for 16 – 18 minutes until the nuts are fragrant and dark brown but not burnt. Remove from oven, cool, grind them, skins and all, in a food processor until finely ground. Rub one baking sheet lightly with butter. Sift the dry ingredients into a bowl. Add the butter and ground hazelnuts and rub the butter into the dry ingredients with your fingers. The dough should barely just come together. Dump the dough onto a work surface and press it together. Using a rolling-pin, roll the dough out to a thickness of about 4 mm. If the dough seems to be cracking, push it back into place and continue rolling. You probably won’t need any additional flour to roll out the dough as it will be quite dry. Using a 3 inch cookie cutter or as I did a drinking glass, cut the dough into circles and transfer to the buttered baking sheet. I fitted them all snugly on one tray. Bake for 20 – 24 minutes. Rotate the pan half way through. Watch them closely towards the end and be careful not to over bake. While you are waiting for the cookies to bake make the syrup. In a small saucepan over a low flame melt the honey, cardamom and orange zest. Do not allow the syrup to boil as you don’t want to reduce the honey and risk crystallization. Stir the syrup and remove from heat, letting it infuse for 15 minutes. Add the orange juice. To glaze the cookies, brush each one twice while they are still warm to give a chance for the glaze to soak into them. The left over syrup can be drizzled over the panna cotta. Delightful as they are or, as a special treat, serve with a vanilla panna cotta.